Your continued support of tutoring and mentoring benefits you, your families, and your community. By donating whatever you can to not-for-profits such as Cabrini Connections and Tutor/Mentor Connection -- programs that host and support tutor/mentor programs -- you help students (that might otherwise give up hope and choose unproductive life paths) achieve greater success in academics, and the tools to participate in constructive career and life paths. 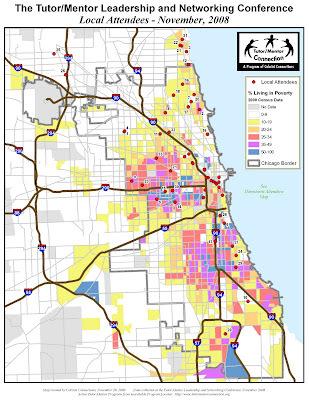 Many kids here leave the Cabrini Green neighborhood and go onto college, become community advocates and leaders, and/or (bare minimum) get a fairer shake in the job market as consumers. The result for YOU is less crime, a stronger local economy, motivated participants in our democracy, a diversified labor/leader/advocate pool, better neighbors, new friends, and awesome karma in 2009. Thanks to all of you who attended the Schubas benefit concert, and who have already spent what you can on tutoring and mentoring this year. 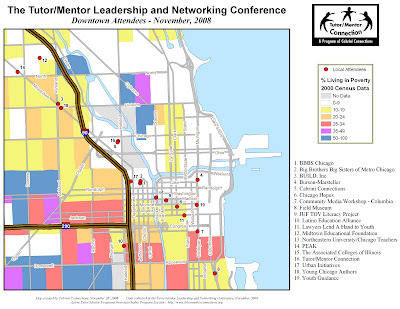 I enjoyed making maps and playing a bit of guitar for the cause in 2008, and look forward to working with you in 2009 to help support/improve these programs for our students. PS..... If you would still like to contribute to an improved society through tutoring and mentoring, please make a year end donation. Peace and Happiness in 2009! 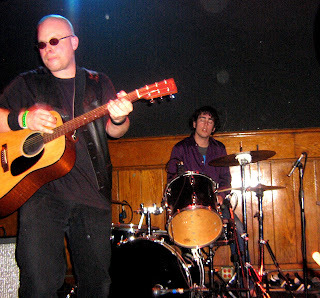 I was really very excited to perform at the event with my band, "Trakan"... alongside Chris Warren's band "Howling Poppies" (Chris in a coordinator for Cabrini Connections, and occasionally plays drums with us, as seen in the picture above - taken at the Schubas benefit). To everyone who could not attend the performance, I would like to personally thank you for any help you have provided for the cause this past year, and for any time or funds donated to Cabrini Connections and/or Tutor/Mentor Connection. ...Maps which have been used by community, business, spiritual, and political leaders to develop strategies that have led to the creation of new programs in areas of need (areas which are easily exposed by creating maps and other visual representations of existing data). As we move into 2009, on the day President Elect Obama has introduced Chicago Public Schools boss Arne Duncan as Secretary of Education, I can't help but hope our city's tutoring and mentoring programs can serve as exemplary models for the nation moving forward. And I dream of continuing to create maps that can be used as strategic tools by the President and his Secretary of Education to make this hope reality. 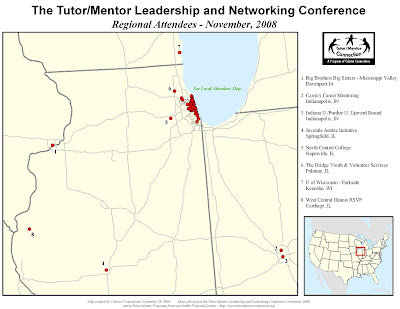 Please help by making a donation this holiday season to support our mapping efforts here at Tutor/Mentor Connection. And continue to enjoy a safe and rocking holiday season! Holiday Concert For Tutoring and Mentoring THIS FRIDAY! We talk about issues related to "poor student performance" and povery all the time... whether in blogs or face to face... and while many of us have decided to volunteer or donate or make contributions toward the tutoring/mentoring cause in different (sometimes creative) ways, here is a no-commitment, laid-back, fun way to help tutoring and mentoring programs this weekend!! 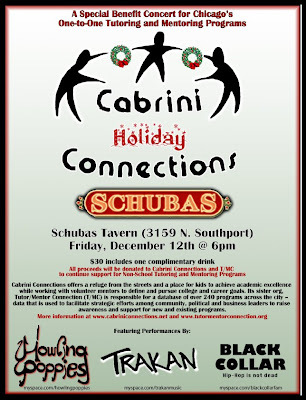 Come out to Schubas this Friday, and hear four bands and have a few drinks... all to support tutoring and mentoring! What can be easier or more fun? In fact, the event is only from 6 till 9, so you can use this as a stepping stone into even more Friday fun late into the evening! And hey, if you can't make it to the north side of Chicago, of course there are other ways you can make a charitable donation to the cause this holiday season. A couple times each year, Cabrini Connections and Tutor/Mentor Connection organize a local conference of folks who are involved with, or interested in tutoring and mentoring. With the goal of sharing resources and information, people come from all over the region and throughout the country to attend workshops and speak on panels. I was also honored to have a chance to present with Dan Bassill in a workshop called "Mapping Collaborative Strategies," where I had another chance to give a tour of our maps to a new audience, and explain how they are used. A lot like I did in this blog. It was great actually meeting other tutor/mentor professionals, and having a chance to talk with a handful who approached me afterward to discuss possible collaborations in creating mapping solutions for their unique strategic tutoring/mentoring purposes. Of course, I am willing to assist others and share information, and look forward to any partnerships this project might generate in our combined struggle against poverty. And of course, the conference gives me a new opportunity to make more maps! As I did back for the May conference, I took attendee data, and created a few maps that show where attendees are working in relationship to eachother - a visual directory of attendees. As always, clicking on these maps will bring up a larger, more detailed version in your browser. But in all, attendance was really strong for a one-day conference, and spending time hearing participants discuss important strategies pertaining to networking, volunteer recruitment, and fundraising was time well-spent for everyone. For more information on the conference, please take a look at Dan's blog or Nicole's blog.